Secret Wars has begun and brings many changes to the Marvel Universe allowing old fan favourite stories to be dusted off and revisited. One such continuity shift that had fans up in arms was the infamous Spider-Man story One More Day. For those not in the know, this story was a magical reset of Peter Parker’s status quo after he made a deal with Mephisto so that he could save his Aunt May. In short his marriage to Mary Jane was stricken from continuity and Peter Parker was returned to being a destitute loser struggling to feed and clothe himself. Naturally it was a controversial move as the version of Peter Parker that was married actually lasted longer than the version that wasn’t so for many people it was absolutely the way they thought of Spider-Man. It seems that the decision to make him single again came from on high and was massively unpopular since it was completely divorced from what fans actually wanted for the character. My opinion on One More Day tends to vary. On one hand it’s hopelessly overdramatic and unnecessary but on the other it’s an idea that was actually fine but executed really terribly. If Peter had to give up his marriage to save Mary Jane’s life then the sacrifice would have had more meaning than his ailing aunt. Despite the fact that she was a mother to him throughout his entire life, she was old and being near death was a common plot point for her. She had already been resurrected once and many felt that letting her go was long overdue. I’m very much in the camp of Peter Parker being more interesting without that level of adult support. He has to truly fend for himself without a mother figure. Also, One More Day led to Dan Slott’s run that started with Brand New Day. Dan Slott did a lot to freshen up the character and presented a lot of really great stories that in many ways reinvigorated Spider-Man out of the clone filled rut that he so often gets stuck into. 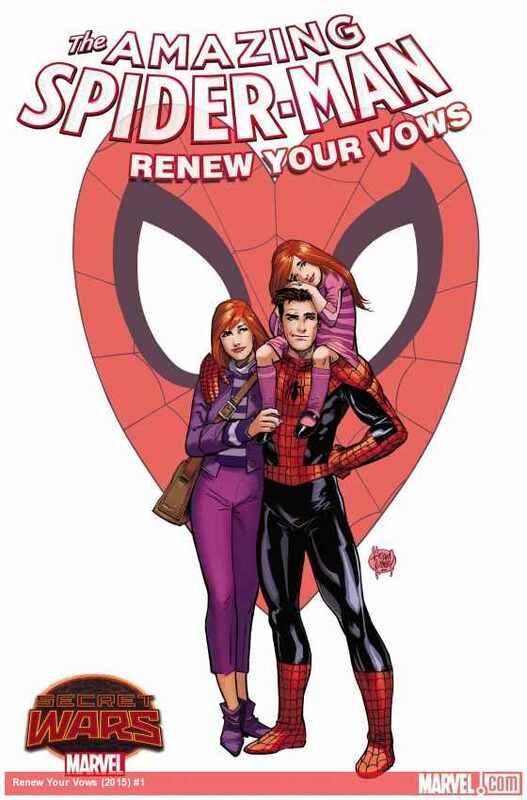 I just wish the Mary Jane marriage had never been dissolved in that way because I love those characters as a couple. With that in mind we have Renew Your Vows which gives us just that, a married Peter Parker who has a child and lives in a continuity similar enough to the early 90s without any clone nonsense hanging around. It’s refreshing to see as it’s immediately a good dynamic. Peter and Mary Jane have always been great together and that objective fact seems to extend to whoever might be writing them. It’s well known that Dan Slott understands the characters in Spider-Man’s world and he shows that off expertly here. Peter Parker is very different to how he currently appears in the main series as is Mary Jane but it’s different in a way that compliments the characters. The struggles will be familiar to anyone who has read Spider-Man comics from the era referenced here. Peter Parker is juggling his family life with his duties as a superhero with his sense of responsibility really getting in the way of him being effective at both of them. There’s an added complication with Daredevil, Moon Knight, Iron Fist and some others being noticeably absent from the costumed vigilante scene which means that Spidey has to do a lot more work on his own and be taken away from his wife and child for longer periods of time than he is comfortable with. Peter choosing his priorities is the central theme of this issue and it is woven throughout. Mary Jane is as always really understanding about it but obviously a little frustrated. It’s all so familiar and great to read. I love the subtext to her interactions with Peter where she points out that he’s not really pulling enough of his weight in the parenting department. A joke about a web diaper proves to be especially hilarious as well as Mary Jane being careful not to say “Spidey” in front of their daughter in case she accidentally blurts it out around other children. It’s a dynamic that is adorable to read and makes me wish that this is how Peter’s life was all the time. Maybe after Secret Wars it will be. It turns out the absent hero problem is more widespread than Spidey initially thought with people like the Punisher turning up dead and the Avengers being on high alert. In this continuity Spidey’s secret identity is unknown to them and that prevents him from achieving full Avengers membership but Iron Man is sympathetic to Spidey’s situation and offers him the opportunity to have his family stay at Avengers Mansion until they can stabilise the situation. It’s something that is seriously considered but is interrupted before an answer is given. 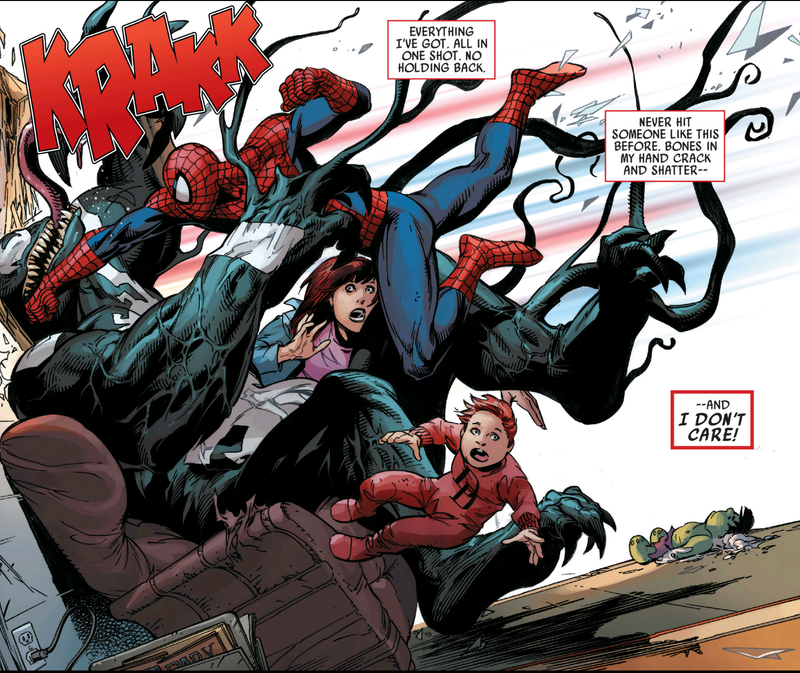 Another thing about this continuity is that Eddie Brock is still Venom and still really hates Peter Parker. It’s great to have this back as this was when Venom was at his most interesting. Being this omnipresent threat who could attack Peter Parker or Spider-Man without warning was always engaging and I’d forgotten how much I missed it. There’s a twist to their antagonistic relationship this time since Peter has a wife and child to protect so he fights harder than he ever has. There is reference made to having never hit anyone that hard before and not caring that he’s done it. Spidey’s fight with Venom is basically on two levels. The surface level is that it’s two old enemies beating lumps out of each other while Peter Parker is determined to protect his wife and child but beneath that there’s a battle going on between two sides of Peter Parker’s sense of responsibility. Venom represents his loyalty to those closest to him and The Avengers battling some vague villain known only as Regent represents his responsibility to the rest of New York. It has always been a burning question in Spider-Man comics over what Peter Parker will do in certain moral situations and being faced with a choice between protecting those close to him and those not as close is a popular one. I really like that this one plays out with Peter choosing without a single doubt in his mind. As far as he’s concerned Mary Jane and baby Annie are his world and therefore must be defended at all costs. Regent is the Avengers’ problem and one they’ll have to deal with without him. There’s no visible hesitation in Peter as he chooses his family and seeing the Avengers defeated so easily by Regent shows that there are very defined consequences to that choice but Peter Parker has solidified his personal priorities probably for the first time ever. The fight with Venom looks great with some incredible artwork showing the various stages. The pages in the burning building are especially memorable. I would say that it’s one of the most exciting conflicts with Venom ever put in a comic book. I’m in 2 minds about Peter’s choice to kill Venom so that his family can live. On one hand I can see why he did it and how he felt like it was the only way to keep them safe but on the other there doesn’t seem to be a lot of remorse shown for his actions. He writes it off as something he had to do and moves on. It’s supposed to signify how committed he is to protecting his family but it’s a little cold blooded for Peter Parker. Similarly the end of the issue where he ignores the Vulture in favour of making sure Annie gets across the road safely feels a bit out of character. I have no problem with the choice and him sticking to it but the fact that he doesn’t seem to regret anything about it doesn’t sit right with me. It should be a constant struggle for him to not rush into action but that’s not coming across. Maybe in future issues this will be the case. A fantastic Spider-Man story that brings back a period of storytelling that I thought was lost forever. Peter and Mary Jane being happily married with a young daughter was great to see and worked really well. The banter between Peter and Mary Jane was sharp and witty with plenty of fun interactions between the two of them. It harkens back to a time in Peter Parker’s life that I really enjoyed and Dan Slott slips into writing this expertly. The underlying issue of Peter struggling to choose between fighting crime and his duties as a father is the central theme here and is explored in some really interesting ways. It’s mentioned that Spidey has been dealing with villains typically handled by people like Daredevil or Moon Knight who are conspicuously absent but when it turns out that they are turning up dead the Avengers rush into action to battle a new villain called Regent. As this is happening Peter has to defend Mary Jane and their daughter Annie from a home invasion by Eddie Brock’s Venom who is out to deprive Peter of everything he holds dear. The ensuing fight is awesome with the theme of choice sitting beneath it all. Peter’s fight with Venom represents his familial commitments and the Avengers fighting Regent represent his commitment to everyone else. The choice is made without hesitation and Peter Parker even kills Venom to keep his family safe. I can understand why the choice was made but I think it came across as a little too cold blooded for Peter Parker. If he had shown more remorse I would be more on board with it. Similarly when he ignores the Vulture there should have been some pang of guilt. It’s definitely a story that has Peter Parker grow up a lot and finally decide what his priorities in life are but I do wonder where it will go from here. It was a great first issue and I loved returning to a variation of a time in Spidey’s life that I always enjoyed reading.